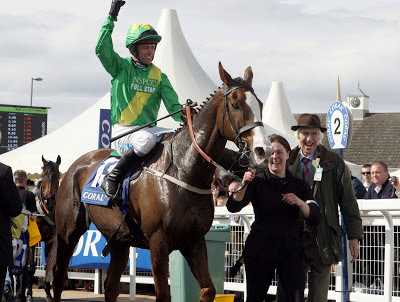 Ayr Racecourse will welcome an equine hero back to the track this Saturday 9 March when Merigo, winner of the 2010 and 2012 Coral Scottish Grand National and runner-up in 2011, contests a race named in his honour. The Andrew Parker trained horse will run in the Merigo’s Looking Forward To Another Scottish National Novices’ Hurdle in his final prep for April’s big race. His owner Raymond Anderson Green has sponsored the race and, whatever happens on Saturday, Merigo should be spot on for April. The 12 year-old has raced eight times at Ayr, winning five times and finishing second twice and third on one occasion. Saturday is Irish Day at the course and the second afternoon of a two-day meeting which kicks off with La Barrique Fine Wines Race Day on Friday 8 March when the feature race is the Tennents Lager Handicap Chase over two miles four furlongs due off at 4.55pm. In addition to the race named in Merigo’s honour, Saturday features two £12,000 races. The Abbott Risk Consulting Hunterston Handicap Chase for the Hugh Barclay Challenge Trophy over three miles one furlong and the Fly Ryanair Handicap chase are run at 3.25pm and 4.35pm respectively. The Ayrshire Post Mares Handicap Hurdle at 2.50pm features the highly promising Little Glenshee trained by Nick Alexander and due to be ridden by his daughter Lucy. Jockeys in action over the two days include Brian Harding, Brian Hughes, Denis O’Regan, Richie McGrath and James Reveley.